I woke up in full bark mode, so we walked in the courtyard instead of going to breakfast. 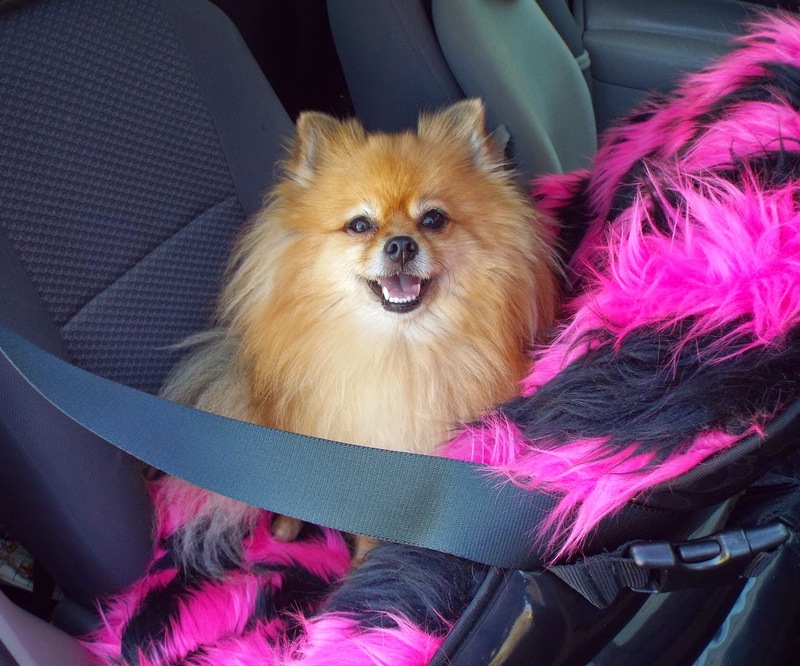 A Pom has just got to bark sometimes. Once I calmed down a bit, we looked at the exhibits again. I was still tired and a little grumpy so the nice people at Hartz gave me new toy to cheer me up. Next, I was able to "earn" some treats! I like to "sit - stay" for treats! You have Whole Life Lamb treats! Of course I will stand up! YUM! I'm in a much better mood now!! BOL!! I saw Dana and Jim again, they are very nice. This time I posed for a photo with Dana. We visited our pals at the Greenies booth, yum!! Then Mom wanted to see a class. I needed a break just before the class ended, so Mom walked me in the courtyard before lunch. 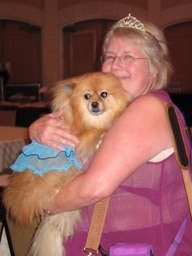 Plush Cokie and I, at the PetSmart luncheon. I think Cokie is looking for shrimp! I smell chicken over there! I'm sleepy, let's go nite nite now pawlease. I'm soooooo tired! I just want to sleep! 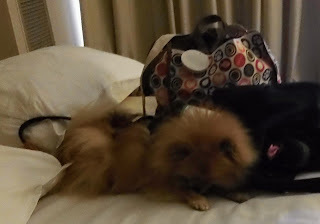 I napped while Mom played with the luggage. I think she was trying to make stuff fit inside it. BOL!! Later, Mom and I dressed in party clothes, and Mom put some sparkles on her head, and put my LED collar & leash on me. 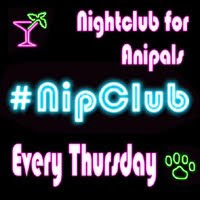 To the pawty we went! 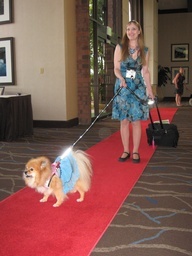 Emmy snapped a photo of Mom and I walking the red carpet to the Nose to Nose Awards pawty! I was happy to cuddle with Emmy. 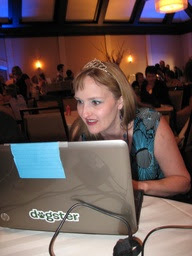 Mom set up our computer at the Twitter table, we were barktending at the pawty. I confess, I was napping in my Sherpa duffle bag under Mom's chair while she typed for me. BOL!! Once again the fabulous Emmy offered to sit me while Mom went visit with her friends. I was so relieved to be able to go with Emmy to our room to rest! Another great photo courtesy of Emmy! How did they fit all those bags in there? We're going home!! I know we had lots of fun, but I am tired and want to pee in my own yard! We piled into the airport shuttle with lots of other BlogPaws people who were going home too! While we were waiting for our plane to board, Mom suddenly realized why she had been feeling sort of ill (headaches, fatigue, nosebleeds) all weekend, she had altitude sickness! She is fine now that we are at our normal altitude. BOL!! When we got home, mom opened the luggage. I wonder how she made all that stuff fit inside our luggage. She's lucky the zippers didn't bust! BOL!! OMD!! Can we say SWAG!?! Looks like we have lots of products to try and blog about, even some to share! I see giveaways in my blog's future! I can't wait until next year's BlogPaws!! 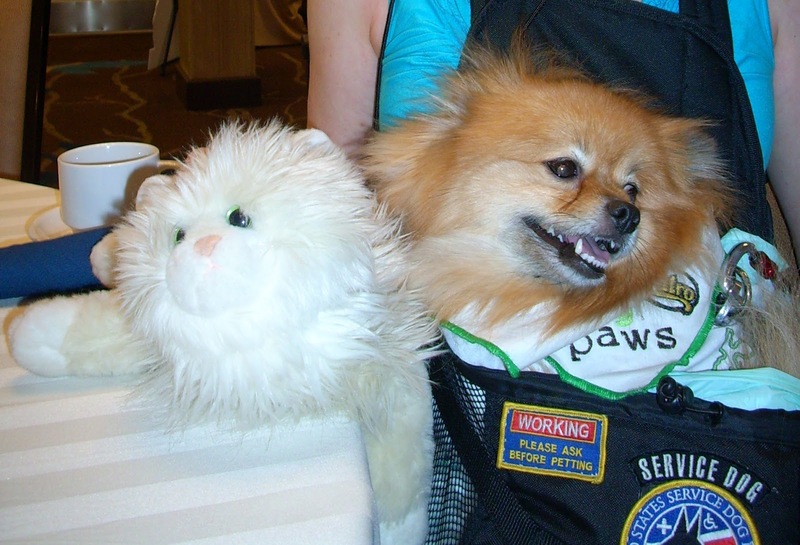 We think you had the most fun of any doggie at BlogPaws, and you even had a nanny, too...boy, you are a special pup! We thought the staff at the hotel were all very nice, friendly and helpful...and they must be magicians, too, to be able to fit all that stuff in that van! Thank you! BOL!! Everyone was very nice. :) I think we all had a wonderful time! 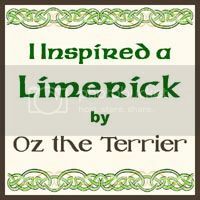 Your blog is soo pawsome.. You met Miss Dana, I bet she is a very pawsome lady.. All those goodies look yummy!! Thank you! I'm glad you like it! Dana is very nice. :) Yes, the goodies are very yummy! BOL!!! I'm sure you would agree! I suspect the dried cod would be one of your favorites! BOL!! Looks like you had a fabulous and busy time. Thank you! I had a wonderful time, and yes, very busy! BOL!! What a pawsome time you had! No wonder you got tired! You'll have lots of fun with all that STUFF!!!! Thanks fur sharing all the photos! Thank you! I am having fun with all the stuff, when Mom gives some to me. BOL!! I'm so glad you had a great time there Pepper! Maybe next year we can meet! woo woo woo! Thank you! I hope we can meet next year, that would be pawsome!!! My mom person was so happy to meet you & your mom person. She's already got plans for Barkworld & BlogPaws next year. Thank you! We enjoyed meeting your mom and flat Oskar!! 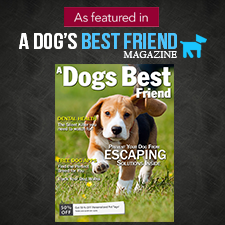 we will be at both BarkWorld and the next BlogPaws!! See you there! !